When someone says "school", what do you imagine? Whiteboards, text books and pencils? At the Orange Foundation, school also means digital tablets that we distribute to schools, in Africa, schools that often have no books and no internet connection. 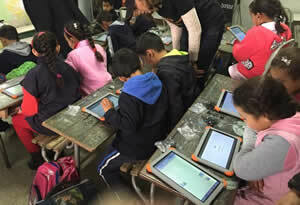 At these schools more than 200,000 children are now accessing essential educational content using tablets. Beginning with a handful of initiatives in 2014, this project has become a fully-fledged digital education drive: the "digital schools" programme. We deliver these programmes in partnership with the Education ministries of each country. They work with us to identify the most appropriate school text books for their pupils, which we then upload into the kit. Because we are convinced that the human factor is central to digital solidarity, we train educational representatives in how to use the kits. Our volunteer employees mentor the schools in their region and deliver training and technical support for the teachers and pupils. 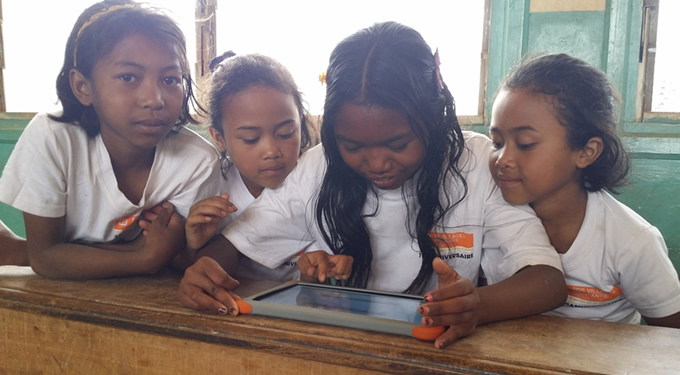 In 2014 our "digital schools" programme numbered 100 schools in 5 countries: Madagascar led the way, then Senegal, Niger, Cameroon and Tunisia joined the adventure. In 2019 there are 200,000; how many will there be next year?